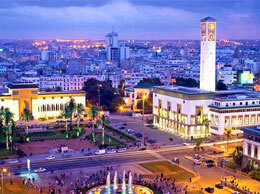 Start the visit from the port and the old city area where you will visit the impressive Hassan II mosque to discover one of the most interesting architectural achievements in modern Morocco before you are taken to explore some of the main streets down town that date back to the French protectorate. The buildings here are made in the art-deco style, built and designed back in 1920’s. Visit the old French food and flower market before you stop on Mohamed V square, one of the main squares of Casablanca, to admire the neo-Moorish style architecture of several official buildings such as the town hall and the court of justice built in 1930’s. Visit the largest church in Casablanca, “Notre Dame De Lourdes”, where you will discover one of the most impressive works in stained glass accomplished by a French artist in the mid 1950’s. Continue to the new Medina to visit the old and most elaborate court house with its traditional Moroccan architecture and design built in 1930’s and which stands now for one of the monuments of the city and the headquarter of the governor of Casablanca. 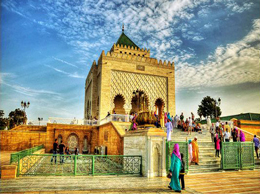 Start the Tour from the port and 08h30 the old city area where you will visit by 09H00 the impressive Hassan II mosque to discover one of the most interesting architectural achievements in modern Morocco before you are taken to Rabat (01H30 min Drive ) where you will discover the political capital of Morocco starts with a stroll in the gardens of the royal palace to discover the building that rules the whole country before you continue to Mohammed V mausoleum considered as the most beautiful architectural monument in Morocco built in the 20th century where the two late kings of Morocco are buried, this is the monument that all diplomats should visit as a part of the protocol. Next you will admire the historical Hassan tower dating back to the 12th century and end your tour in the old fort of the Oudaya to have an idea on how this city was in the past. The Oudaya is still inhabited and keeps its traditions like the old Moorish café where you can sip Moroccan mint tea or Turkish coffee and pastries enjoying the view of the ocean and the old neighbouring town of Salé. Lunch at leisure. Leave Rabat for Casablanca at 14H00 to complete the visit of the City by Visiting the largest church in Casablanca, “Notre Dame De Lourdes”, where you will discover one of the most impressive works in stained glass accomplished by a French artist in the mid 1950’s. Continue to the new Medina to visit the old and most elaborate court house with its traditional Moroccan architecture and design built in 1930’s and which stands now for one of the monuments of the city and the headquarter of the governor of Casablanca before return to the port by 17H00.